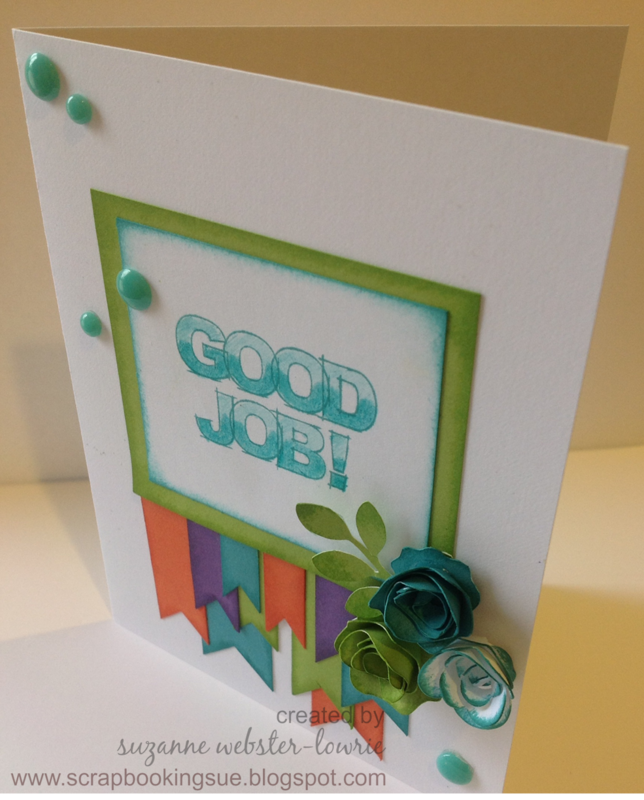 Here is another card made with a cute little mini stamp. 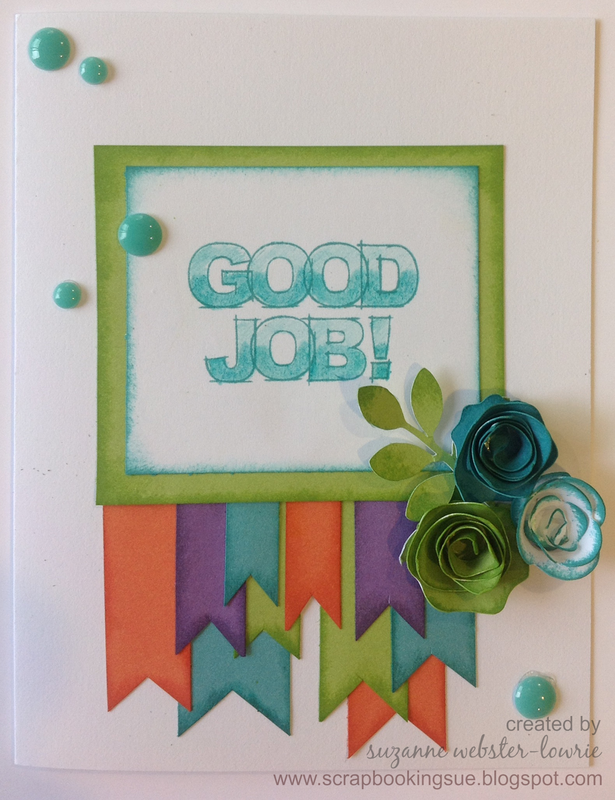 The “Good Job” stamp is sold individually, and is only $2.95! I like that it has a lot of white space in the center that can be colored in. Time to get out your markers or watercolor pencils ladies! 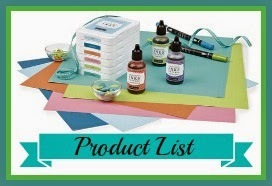 This card measures 4.25″ x 5.5″ and uses the following cardstock and ink color palette: Lagoon (turquoise), Pear (green), Gypsy (purple), and Sunset (orange). The color inspiration came from the Color Dare challenge #101, found here. For the overall design, I followed the Retrosketches challenge sketch #123, found here. 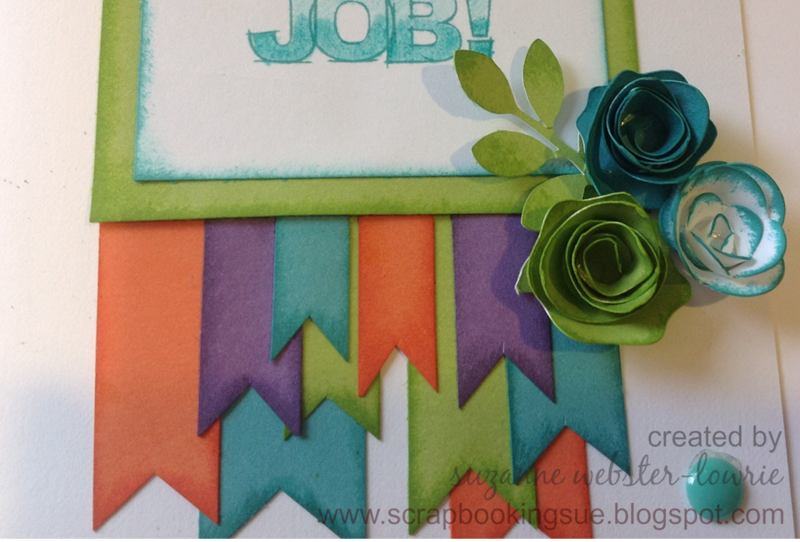 The small banners, background cardstock, and flowers were all inked with their corresponding colors. The three flowers and leaves were cut with the CTMH Cricut Art Philosophy cartridge. And to finish off the card, turquoise colored Aqua Dots were added in various sizes. « Dream Card Using Picture My Life: No Stamps, No Ink, No Kidding! I love all the banners! Thanks so much for playing along at Color My Heart this week and sharing your beautiful creativity with us. Thank you Becca, that's so sweet! Love the ombré colored letters. The banners and flowers are great details, too. Thanks for joining us at Color My Heart this week.